BOND STRENGTH OF SELF-ETCH ADHESIVES WITH PRIMARY AND PERMANENT TEETH DENTIN – IN VITRO STUDY. 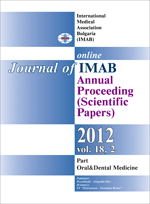 Objective: The aim of this study was to compare dentin bond strength of primary and permanent teeth with self-etching adhesive systems. Methods: On 40 intact specimens of primary and permanent teeth was created flat dentin surfaces. The patterns were divided in 4 groups. Two different self-etching adhesive systems were used – one two steps (AdheSE, VivaDent) and one one step (AdheSE One, VivaDent). Resin composite build-ups were constructed by means of convetional copper ring after applying the adhesive. The specimens were stored in water for 72 h at room temperature. After that specimens were tested for macrotensile bond strength. Debonded surfaces were analyzed by SEM. Conclusions: The measured values of dentin bond strength after applying self-etching adhesives are statistically significant in group of permanent teeth in comparison with group of primary teeth, and for both adhesive generations. Two steps self-etching adhesive provide significant stronger dentin bond strength with both dentitions in comparison with one step self-etching adhesive. Key words: primary teeth, permanent teeth, self-etching adhesives, bond strength, SEM. 11. Еliades G., Watts D.C., Eliades T. Dental hard tissues and bonding. Springer 2005; 109-122. 33. Technical specification ISO/TS 11405. Dental materials –testing of adhesion to tooth structure. Switzerland; 2003. 41. Yaseen SM, Subba Reddy VV. Comparative evaluation of shear bond strength of two self-etching adhesives (sixth and seventh generation) on dentin of primary and permanent teeth: An in vitro study. J Indian Soc Pedod Prevent Dent. 2009 Jan-Mar;27(1): 33-38. [PubMed] [CrossRef].